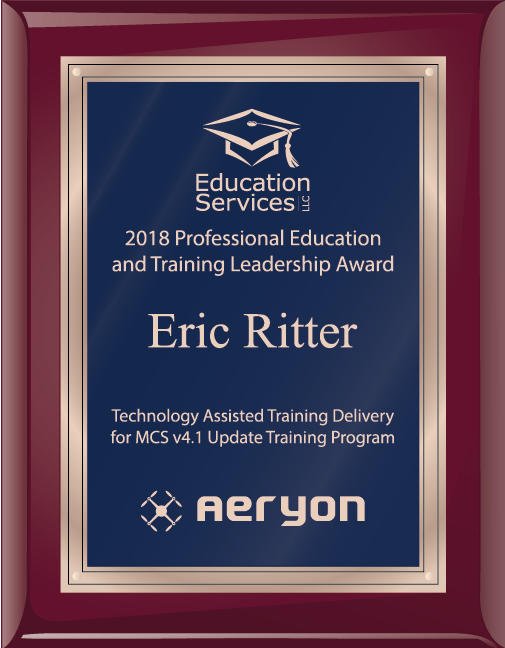 SALT LAKE CITY, UT, UNITED STATES, March 19, 2019 /EINPresswire.com/ -- Education Services LLC is proud to recognize Eric Ritter of Aeryon Labs with a 2018 Professional Education and Training Leadership Award for Technology Assisted Training Delivery. Eric is being recognized for his leadership and initiative in creation of the MCS v4.1 Update Training Program. 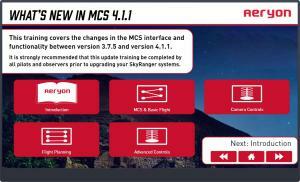 Version 4.1 of the Aeryon Mission Control Software (MCS) delivered many improvements but also significant changes to the user interface. Eric recognized the importance of training the world-wide customer base on this important new release prior to installation by end-users on their aircraft and command tablets. He oversaw creation of the MCS v4.1 Update Training Program which teaches operators about the changes and enhancements in this important release. All customers world-wide were given advanced access to the training program which included multi-media explanations and demonstrations of the new and changed functionality, and included access to modules from the full Level 1 training program that includes interactive learning and practice activities, guided practice pseudo-simulations, and access to the fully functional cloud-hosted MCS simulator. During installation of the upgrade, operators are again given another opportunity to immediately access the online cloud-hosted MCS simulator from their web browser, in their choice of 11 languages, with just a single mouse click. This approach helped to ensure that all customers had the opportunity to learn about and practice with the new user interface before upgrading their aircraft and command tablets. Congratulations to Eric Ritter and Aeryon Labs on this exceptional achievement! Eric Ritter is the Director of Customer Service and Training at Aeryon Labs, based in Waterloo, Ontario, Canada. 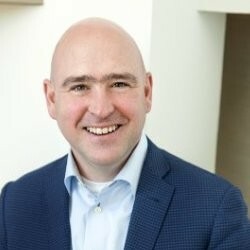 He was previously Vice President of Security Operations at eSentire, Director of Sales Engineering at Desire2Learn, and served in numerous positions at Research in Motion including Senior Director of Operations & Program Management. Aeryon Labs Inc. is a leading provider of high-performance drones and software solutions for military, public safety, and commercial customers around the globe. Aeryon’s battle-tested Unmanned Aircraft Systems set the standard for real-time, secure, aerial intelligence across a wide range of mission-critical applications from clandestine tactical missions, to search and rescue operations, to commercial inspections and more. Aeryon drones are deployed with over 20 militaries and in use with customers in over 30 countries.